The Superman Fan Podcast: Episode #380 Part III: Superman Family Comic Book Cover Dated March 1965: World's Finest Comics #148! Episode #380 Part III: Superman Family Comic Book Cover Dated March 1965: World's Finest Comics #148! World's Finest Comics 148, March 1965! WORLD'S FINEST COMICS 148, March 1965, was published on January 25, 1965. It contained 32 pages for the cover price of 12¢. Mort Weisinger was the editor, and the cover was pencilled by Curt Swan, inked by George Klein and lettered by Ira Schnapp. - (8:07) SUPERMAN AND BATMAN - OUTLAWS (17 pages, Part I being 8 pgs. long), written by Edmond Hamilton, pencilled by Curt Swan and inked by Sheldon Moldoff. 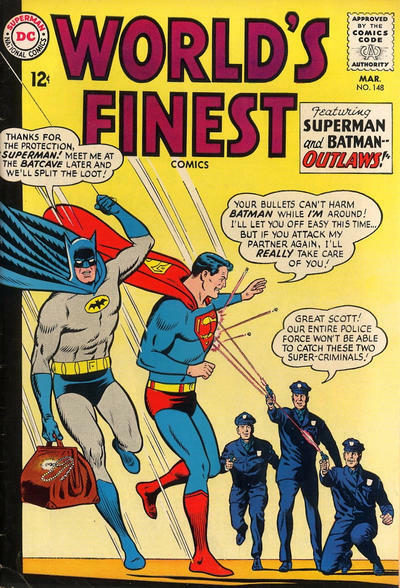 This story was also reprinted in SHOWCASE PRESENTS: WORLD'S FINEST vol. III. - (41:34) CAPE AND COWL COMMENTS letter column. - (52:02) THE NINTH WONDER (6 pgs. ), written by Robert Bernstein and drawn by Howard Sherman. This story reveals the origin of Congorilla. It was originally published in ADVENTURE COMICS 270, March 1960, published on January 28, 1960. Elsewhere in DC Comics, 29 titles carried the March or March/April 1965 cover date, according to Mike's Amazing World Of Comics. Next Episodes: SUPERMAN COMIC BOOKS COVER DATED APRIL 1965: PART I: SUPERMAN 176, PART II: SUPERMAN'S GIRL FRIEND LOIS LANE 56, PART III: ACTION COMICS 323 & PART IV: SUPERMAN'S PAL JIMMY OLSEN 84! First of all, I must say that I really like the idea that, even as criminals, Superman and Batman are friends and partners, which is the way I prefer to see them (as friends, not as criminals). It was interesting to see both the similarities and the differences of Earth-1 and the alternate Earth. Both worlds had Ma and Pa Kent, for instance, but the criminal Kents influenced Superman toward a life of crime, as the criminal Thomas Wayne influenced Bruce toward a criminal career. Obviously, parental influence plays a major part in both Superman's and Batman's destiny on each Earth. It was good to see Perry White as the District Attorney prosecuting Superman and Batman, but it might have been interesting, too, to see Harvey Dent (Two-Face on Earth-1) as an upright District Attorney on the alternate Earth, since he'd started out that way on Earth-1. One thing that surprised me a bit on the alternate Earth was that their Jimmy Olsen had a fan club. I always assumed that he had such a fan club because of his friendship and adventures with Superman, but maybe, on the alternate Earth, he and Luthor were friends and shared adventures. All in all, I thought this was a very good story, in the vein of the classic Imaginary Tales of the Silver Age, although this was more a multiverse story than an imaginary one. The alternate Earth angle was the best part of the story, kind of a "Mirror, Mirror" World's Finest universe.